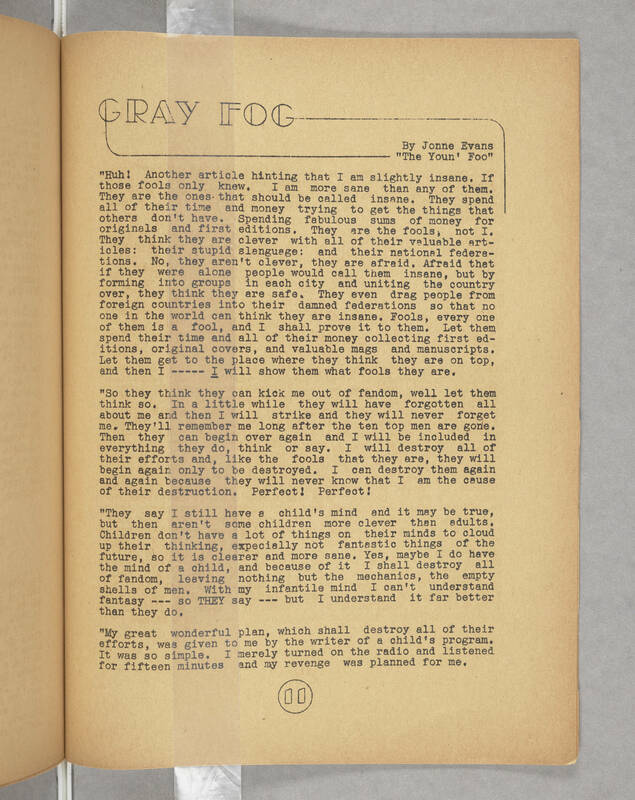 GRAY FOG By Jonne Evans "The Youn' Foo" "Huh! Another article hinting that I am slightly insane. If those fools only knew. I am more sane than any of them. They are the ones that should be called insane. They spend all of their time and money trying to get the things that others don't have. Spending fabulous sums of money for originals and first editions. They are the fools, not I. They think they are clever with all of their valuable articles: their stupid slanguage; and their national federations. No, they aren't clever, they are afraid. Afraid that if they were alone people would call them insane, but by forming into groups in each city and uniting the country over, they think they are safe. They even drag people from foreign countries into their damned federations so that no one in the world can think they are insane. Fools, every one of them is a fool, and I shall prove it to them. Let them spend their time and all of their money collecting first editions, original covers, and valuable mags and manuscripts. Let them get to the place where they think they are on top, and then I ----- I will show them what fools they are. "So they think they can kick me out of fandom, well let them think so. In a little while they will have forgotten all about me and then I will strike and they will never forget me. They'll remember me long after the ten top men are gone. Then they can begin over again and I will be included in everything they do, think or say. I will destroy all of their efforts and, like the fools that they are, they will begin again only to be destroyed. I can destroy them again and again because they will never know that I am the cause of their destruction. Perfect! Perfect! "They say I still have a child's mind and it may be true, but then aren't some children more clever than adults. Children don't have a lot of things on their minds to cloud up their thinking, expecially not fantastic things of the future, so it is clearer and more sane. Yes, maybe I do have the mind of a child, and because of it I shall destroy all of fandom, leaving nothing but the mechanics, the empty shells of men. With my infantile mind I can't understand fantasy -- so THEY say -- but I understand it far better than they do. "My great wonderful plan, which shall destroy all of their efforts, was given to me by the writer of a child's program. It was so simple. I merely turned on the radio and listened for fifteen minutes and my revenge was planned for me.